Rhino Shield is something you may be reading about more and more in the near future. It is just starting to become popular as an alternative to painting a home. If you live in Massachusetts or any of the other the New England states you already know that our varied seasons can do a number on a homes exterior appearance. It is not uncommon to have to paint a home every three to six years or so depending on the quality of the paint used, the number of coats applied and the skill level of the painter. The Rhino Shield system offers an alternative to a traditional paint job. From the company’s website the description of Rhino Shield is as follows “Rhino-Shield Ceramic Coating is a durable, flexible maintenance free wall coating. It is a high build acrylic-urethane-elastomeric formula that waterproofs, insulates, and soundproofs. More than likely a home owner would consider using this product when they know that they are going to be in the home for an extended period of time. The cost of a Rhino Shield coating is much more expensive than a typical paint job. A ball park estimate on cost would be similar to what it would be to install vinyl siding. So the hitch is that you would need to be in the home a while before you would see a return on your investment. 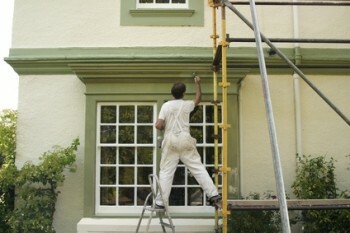 Over time however you could see a return on your investment by never having to paint your home again. At least according to what the company expresses through their advertising. Rhino Shield offers a 25 year warranty on their product and claims that it will last a lot longer than that. According to their website the product can be used on any exterior house surface, including wood, stucco, siding, brick, cement block and concrete. Rhino Shield is waterproof because it incorporates variable sizes of ceramic micro spheres as fillers. This also makes this paint perfect insulation to reduce energy cost. From everything I have been reading on this product the preparation work prior to application is of the utmost importance. It is critical that before the Rhino Shield product is applied a thorough power washing is done followed by a repair of any necessary areas. All existing paint should be sanded, scraped and then caulked. Once these steps are taken the wood is primed using Rhino-Shield Adhesive Primer Sealer. They then finish with the top coat, a Rhino-Shield Ceramic Coating, to all the wood surfaces. The unique properties of Rhino-Shield allow wood to breathe while preventing moisture from permeating. This gives the wood superior protection over typical paint which either suffocates and rots the wood or peels and flakes and allows moisture to damage the wood. Rhino Shield Ceramic Coating provides superior mildew resistance, corrosion resistance and ultra-violet ray protection. The Rhino Shield product would certainly qualify for the every popular “green movement” as well. Their ceramic top-coat product is a low-e thermal barrier that may reduce you energy consumption, and because of the mil thickness, Rhino-Shield can be used to encapsulate lead paint. Lastly, any product that extends the life cycle by fifty percent or more beyond the industry average is considered green! One of the things that immediately comes to mind about this type of product is those consumers who are “traditionalists” yet hate the fact that clapboard siding and the painting involved is a constant maintenance issue. There are many including myself who love the look of a clapboard sided home. For many a vinyl sided home does not have the same appeal but they opt for it anyways because they have grown tired of spending the necessary money keeping their home looking good. In the Massachusetts area anyway, it is fairly uncommon to see million dollars homes with vinyl siding. Using Rhino Shield could end up being a best of both words scenario where you can keep the traditional look of wood but also end up with a low maintenance home at the same time! As with any product I would highly recommend you do your research. Rhino Shield may or may not be right for you. My recommendation would be to speak to a few people who have used the application and get their perspective. Better to hear it from the horses mouth than a biased company rep telling you how wonderful the product is. To get an estimate from a Rhino Shield representative for your home you can call 1- 888-90-RHINO or check out the Rhino Shield of New England Blog. Also for a better understanding of Rhino Shield you can watch the video below. If you end up deciding that painting is something you would rather do, I would highly recommend you check out Duration Paint by Sherwin Williams. I had my home painted with this product three years ago and it still looks outstanding. Duration paint is much more expensive than traditional paints but will last far longer. It is considered a superior painting product! About the author: The above Real Estate information on Rhino Shield an exterior painting alternative was provided by Bill Gassett, a Nationally recognized leader in his field. Bill can be reached via email at billgassett@remaxexec.com or by phone at 508-435-5356. Bill has helped people move in and out of many Metrowest towns for the last 24+ Years. Also what does maintenance free mean? Once it gets dirty its ability to reflect heat is reduced considerably. Tinting will also reduce the effectiveness. All great questions Morris! I am not a representative for Rhino Shield but have seen the product and was impressed by the look. The “look” and attributes now could certainly change in the future. I would encourage anyone reading on the product to do their due diligence. Some of the questions you pose are worth researching. Interesting product, will be interesting to see if it gains popularity. It promises great things and if it holds true many consumers along the coast will start applying Rhino Shield. Can’t wait to read consumers’ reviews. Great Information, Thank You Bill .